Hollywood Shuffle is an interesting board game where you write the movie any way you want to. Plot elements are revealed (such as the lead character, the action or twist) by rolling the dice. Then players must write down the cast, ending or title of their new movie. All answers are read aloud and the fun begins. Hollywood Shuffle challenges you to see if you can create a plot more ridiculous than Hollywood. This board game contain over 200,000 hilarious movie plot combinations. 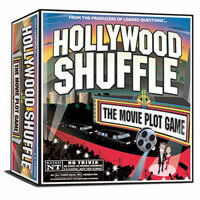 Hollywood Shuffle is a laid back game that will let you and your friends and a good old time playing Hollywood writers. Play Hollywood Shuffle today! There are no right or wrong answers in Hollywood Shuffle. Players choose their own title, cast, or ending to their movie. No movie trivia knowledge is required. Please keep in mind that the official Hollywood Shuffle board game rules and instructions could be different depending on the game version you have. The rules below are some of the exact directions on how to play Hollywood Shuffle. Share with us your comments, funny stories, tips, advice, strategies, creative ways to play, questions about how to play, problems with the rules or anything you want about Hollywood Shuffle. All submissions will be reviewed within 24 hours. Click here to add your Hollywood Shuffle comments.